Being a lover of all things Bayeux-Tapestry-related, I think it’s ok to share this article with you, even though it’s technically not about embroidery. Well, I take that back. It is about embroidery – it’s about how a piece of embroidery from a thousand years ago helped an artisan today. The story comes from the Daily Mail online, and it tells of a wood carver who, to overcome the grief of losing his sixteen-year-old son, turned to the Bayeux tapestry – with carving tools. Normally, we talk about the Bayeux Tapestry worked in wool. But Jason Welch worked his version by hand in wood. Ah – the difference one letter can make! 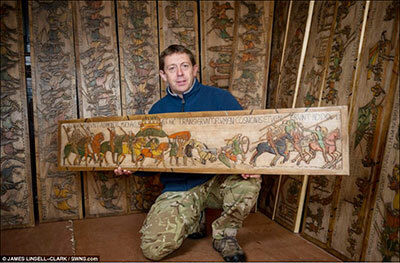 The original article about the wood-carved Bayeux tapestry features pictures of the hand-carved wooden panels. The panels are gorgeous! Embroidery is pretty influential stuff, isn’t it? Hope you enjoy the article and the photos! What an inspiring story! Jason has done a brilliant job, not only with the carving, but interpreting each panel so beautifully. Thanks for sharing! Incredible! With stitchery one can alway frogit but a mistake on wood seems to me to be devestating! Oh my! Such an amazing story. Each panel in so beautiful. Mr. Welch has done just a terrific job! I do agree that embroidery is pretty influential stuff. Even without knowing Jason and reading of him here for the first time I’m so proud of him. His skill and perseverance deserve to be recognised and I’m greatly hoping someone is able to display this masterpiece appropriately and for quite some time. I also hope that, through this amazing work, his dreadful heartache has eased enough so that precious memories, acceptance and comfort are coming more and more to the fore. Thank you so much for posting this Mary. Yes, embroidery knows no bounds or time. How interesting it’s so beautifully crafted and it took 2 years in his spare time to complete the project. As you say the difference a letter can make between woo-l and woo-d it still hand crafted and both are art in different ways by using different natural fibres. Great work Jason. Wow! It’s an amazing piece of craftsmanship. Beautiful. Thank you for sharing the link, I know I wouldn’t have come across it on any of the sites I normally follow. If you love the Bayeux Tapestry then you’ve probably read “A Needle In the Right Hand of God” haven’t you? If you haven’t, I’d recommend it. It’s the remarkable history of the B.T. The tapestry looks really great on wood. I am working on exactly the same piece of the tapestry that those shown on the picture, but just with wool. using pictures of the real tapestry, I try to understand how the old embroiderers worked. Out of sorrow, sometimes wonderful things can come. Mr Welch did a wonderful job re-creating the tapestry in wood. I hope he finds somewhere to have it displayed. Interesting reading about the Bayeux Tapestry. There is a man here in Waterloo, Ontario who has stitched the entire piece. The end of the tapestry was destroyed and he added what he thought might have been. He used beige tones instead of the colours from the tapestry. The tapestry is to appear in a soon to be released movie with George Clooney and Matt Damon “The Monuments Men”. Ray was featured in our local paper in Nov. I have a copy and if you let me know I can forward it to you. Soon the tapestry will be on display at a local church. In May the embroidery guilds from south western Ontario will hold their annual meeting at this church and will see the tapestry and hear all about its construction. Amazing carving. I would like to think his work would become an adjunct to the original Bayeux Tapestry. Mr. Welch is very talented. Mr. Jason Welch is a very talented man. Thank you for sharing this. His complaint about the missing fingers is truly a problem. When my husband, who works with his hands for a living, was seventeen, he lost his left ring finger and damaged the middle finger due to a work accident. As he has gotten older, there is an ebb and flow of a deep ache in that hand, and due to the imbalance of his fingers, from time to time must tape the forefinger/middle finger together to facilitate function. Mr. Welch worked through a good bit of pain to create something beautiful. This carving project is a labor of love. Not only did he create something quite beautiful, it also helped heal his loss. I am suspecting that most, if not all of us, who visit this site understand the healing power of making and creating with embroidery and probably other media as well. Oh Mary, thank you for sharing… the carvings are so beautiful and I do hope he finds a place that will display them as they do deserve to be seen! Thank you so much for sharing this article. What a beautiful piece of work, it just goes to show what a master craftsman can do. Amazing! Thank you for sharing this incredible work. Oh ! Blown away by this ! I hope it gets put into the British Museum for us all to see ! Thank you so much for sharing this. I have seen where a couple of folks have made stitched replicas but not carved. It is an amazing piece of embroidery that has fascinated so many folks for centures. Some friends were able to see it, ‘in person’, last fall and I was green with envy! They did bring me a shopping bag with a scene from the tapestry on it however :). Thanks again! Saw the original in Bayeux a couple of years ago. It is a daunting piece of work, even with missing panels. It is shown under subdued light to try and preserve the colours but some of the brilliance still exists. He has done a brilliant job of reproducing the tones in the wood. Hope someone in the UK finds a permanent place for it. Wow! This guy has talent! It’s hard to believe that he did this with wood…so many parts of it look like actual fabric. I love wood carving, but haven’t tried it. I have done marquetry and parquetry. I enjoyed the article on this man. Thank you for bringing it to us.